There are lots of great places to go in California. I like Disneyland in Anaheim, and Universal City in Los Angeles. They both have movie theme rides and many different foods to eat. The Grauman's Chinese Theater and El Capitan Theatre in Hollywood are very old and show the latest movies. Kodac Theatre is were the Academy Awards are, and days before the awards are given they close the street to put down the red carpet. To eat you should try Cecil's Rib place in West LA, and for the best deli food go to Greenblat's on Sunset Boulevard, right near the Comedy Store. Pink's Hot-dogs on Melrose always has a line around the block. They serve many different kinds of hot-dogs. My favorite food at a hotel is the Kobe beef burger with an egg at the Hotel Bel-Air. It is the best tasting meat and it is served with French fries in a silver cup - very cool! Boil the eggs for ten minutes in boiling water, and then put them in a bowl to cool to room temperature. Always have your mom help with any cooking job. These eggs are really simple to make. Just drizzle rubber cement over the egg, let it dry, then color the egg. The cement part stays white and makes a really different design.When it is dry peel off the rubber cement. You can also take your paint brush and paint and draw designs or write the name of your family members on them. You can also fill white spaces on colored eggs with another color. You can paint the egg container to serve them at your Easter breakfast or party, or you can get a basket, put some green grass in it and serve the eggs from the basket. 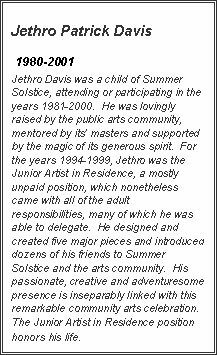 The Summer Solstice group announces a call for applicants for the annual Jethro Davis Memorial “Junior Artist” Scholarships. Designed as an artistic mentorship with a limited number of positions, this program is open to teenagers 14-21 years of age to work directly with Solstice Staff artists on the creation of ensembles for the parade in our community arts workshop. This hands-on program teaches young artists about every facet of the celebration arts and includes an honorarium of $500 to be awarded at the completion of the workshop at the end of June. Solstice provides the expertise, the materials, the instruction, and the place for young artists to use their creative talents, and has established after-school workshop hours to accommodate young, aspiring artists. Due to the limited number of positions, interested young artists are encouraged to submit a letter about themselves and their desire to participate in this program by April 15, 2007. Letters may be submitted via email, fax, or mail, but must be received by April 15th to accommodate the workshop schedule of early May – late June. The Summer Solstice Celebration is a 501(c)3, nonprofit, community organization that celebrates life through art by encouraging participation in the arts through events and education. The core of the celebration begins with a community arts workshop opening in early May through the end of June. Solstice provides a paid and professional artistic staff, “artists-in-residence”, who teach and assist community members as they create floats, masks, costumes, giant puppets and banners for the Parade. Funding comes from a variety of events, business sponsorships, personal contributions, grants, and proceeds from the sale For more information about the Summer Solstice Celebration, please visit our website: www.solsticeparade.com or call 805-965-3396. Reading is a foundational skill no one can afford to be without. Unfortunately, studies show that nearly a third of adults in America are either marginally or functionally illiterate. That's why helping young children develop a love for reading has become the main goal for Deloris Seymore-Reyes, a Michigan native who recently started a full-time business offering personalized children's books. With personalized children's books, parents are able to win the fight against illiteracy by encouraging their child to read in an unusual way. Personalized children's books are unique books that incorporate the child's name into the story. When children open the books and begin reading, they realize from that moment that they are the star of the book. They are amazed when they see their own name in print alongside their favorite characters. Seeing that they are one of the main characters of the book helps to build the child's self esteem and reading confidence. They can actually fight the bad guys with Spiderman (TM) or attend a ballroom dance or ballet with royalty in the "Ballerina Princess." "As a child imagines himself playing the part in the book, he will be anxious to continue reading, and his reading skills will improve," states Seymore-Reyes. Learning to read skillfully at an early age is the key to long-term reading success. A recent study by the National Institutes of Health showed that 67 percent of students that were at-risk for reading difficulties became average or above-average readers when they received help during early school years. Personalized children's books help to build these skills early on without pressure. Parents are finding them to be great summer-time books to enhance reading skills while school is out as well as great bedtime books. The books help children to develop a positive outlook on life and look forward to reaching future goals. Parents also enjoy saving the books as keepsakes once the child has grown. "I enjoy seeing children smile when they read their own name in the book and realize they can be the star of a book. Children feel they can really be somebody and will often continue to build their skills for a lifetime," states Seymore-Reyes.